A few months ago I signed up to go on a self-supported tour organized by the Portland Wheelman cycling club. The tour was over Memorial Day weekend and went from Vancouver, WA east to Biggs, OR. The route snaked along the Columbia River Gorge on the WA side, crossed over to Oregon and then back west to Portland again, totaling about 240 miles over four days. The ride was limited to 50 riders and 42 showed up to start–the cold and rain weeded out a few. I was the only recumbent rider on the trip, having chosen to ride one of my favorite trike: a Greenspeed GT3 with Arkel RT40 bags. I’ve been cycle touring since 1977 and this was the first time I’ve ever done a tour with a large group. Most of my touring has been either solo or with one close friend or my spouse, but I thought it would be fun to try a ride with a large group. I had little to no experience as to how riding a fully loaded trike would mesh with folks riding diamond frame (shortened to d.f. from here on out) bikes–it would be interesting to compare relative efficiency. Most of the riders were quite fit and cycle regularly. Almost everyone had previously done extensive loaded touring before. Most riders were 45-65 years old, with a few very fit twenty-somethings to boot. When the group gathered at the start, there was some curiosity about my chosen ride and the usual discussions about width and visibility on the road. I enjoyed the opportunity to expose people to another approach to cycle touring. We were sent a cue sheet by email so I had that with me but since I was unfamiliar with the area, I opted to ride with one of the tour organizers and his wife for the first section. It was starting to drizzle a bit as we left and headed down to connect with route 14, which follows the Columbia river over city streets and back roads and some very rough and broken pavement. The bumps had me thinking maybe I should have brought the ICE Adventure FS demo from our shop! However, the GT3 handled it ok and no worse than the rigid frame Surly Long Haul Trucker touring bikes ridden by my companions. I have been riding my GT3 sans fenders, since my hometown, Bend, is on the dry side of the Cascades. Now, facing possible rain every day for the next four days, I was regretting my decision not to order a set of fenders from Greenspeed USA for this trip. At least I had a rear fender, and the spray off the front wheels was not going into my face. After our first stop, I fell in with a group of four women I dubbed the “Wild Girls,” based on various schenanigans that shall remain unreported here. They were all teachers and, except for Katie, who was doing her first loaded tour on a carbon road bike, they had done many trips before. I generally like to ride at a brisk pace when I’m touring and the women were clipping along at a nice speed. We passed some other riders in the process as we rode Hwy14 east toward our first group campsite for the night. We had a slight headwind most of the day so that helped the pace, but when we got close to the Bonneville Dam I found I was having to work not to drop the others. I was spinning along between 22 and 26 mph and ended up at lunch close to 30 minutes ahead of my companions. Over the course of the first day, riding with folks on d.f. bikes, the differences between our chosen rides became apparent. As I expected, trikes will be slower up long climbs and faster on the descents. What surprised me was the degree of the difference between trike and d.f. performance. On short climbs, there appeared to be little to no difference in the riding effort. On longer, steeper climbs, say 700 to 1000 feet of elevation, I would be slower than the fastest of the Wild Girls, but not as much as I would have thought. Cindy, who was very fit (last year she rode a century per day in every state over 50 days) would top out 100 to 200 yards ahead of me, but then I would pass her within a quarter mile after reaching the top and, unless I deliberately slowed down, wouldn’t see her or any of the women again until a lunch stop. Over the course of the four day ride, I rode with a number of other very fit riders and the climbing dynamic remained consistent. The aerodynamic advantage of trikes, especially when riding with panniers, was much greater than I expected. Whereas on a d.f. bike with bags, you have an aerodynamic disadvantage, creating drag and turbulence, on my Greenspeed, with the RT40s tucked behind me like a tailsock, plus the slight added weight of the trike, I was so much faster and more efficient it blew my mind. And the minds of many of the other riders in the group as well! This was especially the case on some of the very steep luge run descents I did.On our third day, riding from Hood River to our last camp, the wind was blowing out of the east as it normally does at 20-25 mph. We left Hood River after lunch at an awesome brew pub and a stop for groceries, and headed into the wind. The Wild Girls started to ride a paceline and I stayed at the back for a bit but ended up coasting so much I was constantly riding my brakes. I thought I’d try letting them get at least a minimal draft off me and I’d pull them. Unfortunately, this didn’t work at all—because of the lower wind resistance on my trike, I found it too hard to match their speed. Soon I decided I was being more a hindrance than an assist and took off for camp. On the flats, I was averaging 18-20mph, whereas my companions were struggling to maintain 11-12mph. The wind was often blowing over the guardrail I was riding next to, but my low position on the trike kept me well-shielded. Having toured extensively on both d.f.s and recumbents (bike and trike), but never before having a direct comparison of the relative efficiency of the two modes of travel, my conclusion from this trip is, “Why the heck would anyone want to tour on a diamond frame bike? !” I can understand the traditional appeal of a regular bike–I still love the way a beautifully made, lugged steel custom d.f. looks. And some cyclists still think the d.f. bike is the only “real” bike, whereas I have concluded that trikes, and recumbents in general, can be considerably more efficient and comfortable for cycle touring. I saw firsthand that recumbents are not only more comfortable (the group was vying for who got to sit on the trike at dinner rather than on the hard picnic table seats! ), but faster overall. And if a trike is this much faster, a recumbent touring bike, such as a Tour Easy or a Lightning Phantom would be that much more so. Touring is not racing, but maximizing efficiency either gets you to camp at the end of the day quicker and fresher, or gets you further down the road. Since our trip I’ve had two riders from the group contact the shop about buying a trike for touring, so maybe I even opened a few minds over this fun weekend. 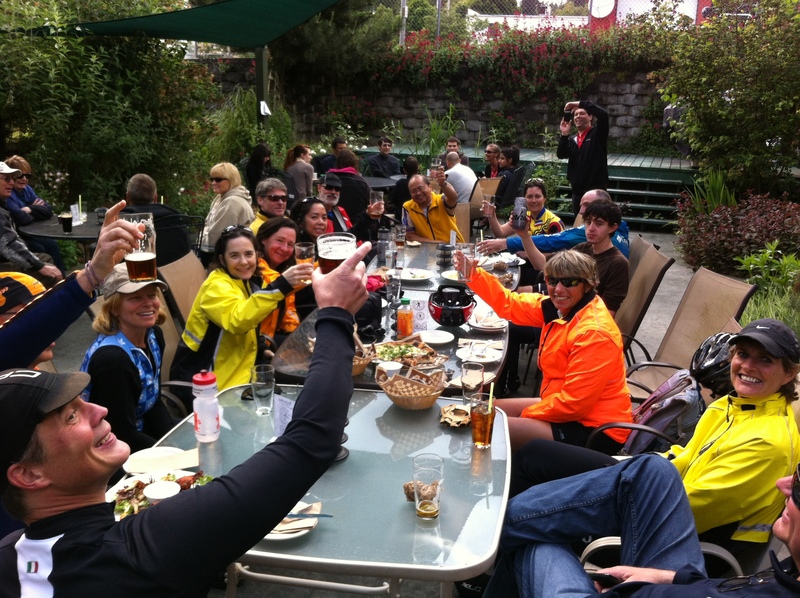 It was certainly a great way to kick off a season of recumbent touring!